In the Press – Hispanic Food & Culture in L.A. 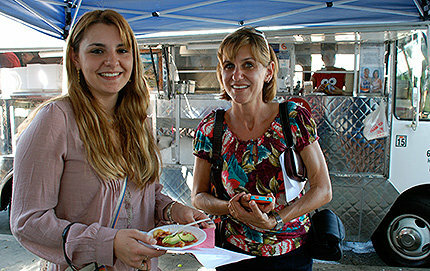 In a course taught by Sarah Portnoy, USC Dornsife students learn Spanish via the lens of L.A.’s food truck revolution – including a gastronomic tour through the Boyle Heights neighborhood of East Los Angeles. USC Dornsife undergraduate students ventured to myriad Latino eateries throughout Los Angeles to practice their Spanish, get a flavor of Hispanic food and culture, and learn about food-related issues in their community. Taco talk: Food and history scholar Jeffrey Pilcher will discuss his new book, “Planet Taco: A Global History of Mexican Food” at USC on Tuesday. The discussion is part of a course titled “The Culture of Food in Hispanic Los Angeles” but is open to the general public. Taco lovers unite! Jeffrey Pilcher will be at USC to discuss his new book,Planet Taco: A Global History of Mexican Food. Explore the history and meaning that the beloved taco has to our national, cultural, and ethnic identity while enjoying the delectable cuisine itself.